Trumpets flare as women in yellow, red, green and purple skirts fan around the Golden State Warriors basketball court, five minutes before the game begins. 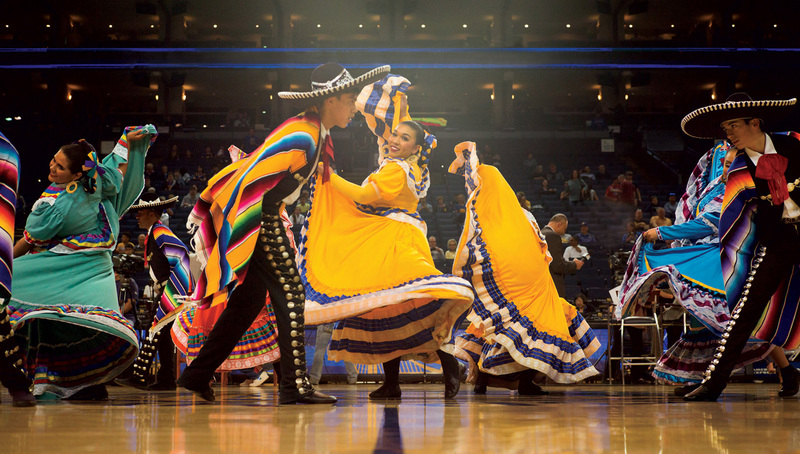 Crystal Perez-Reymundo, ’19 Civil Engineering, spins her skirt on the half court line, surrounded by the gritos of fellow SJSU Grupo Folklórico Luna y Sol dancers performing with the Ballet Folklórico de James Logan High School. Their voices are triumphant as they imitate a pelea de gallos, or rooster fight, at the second annual Latino Heritage Night. For Crystal Perez-Reymundo, ’19 Civil Engineering, folklórico is a vital expression of self. Perez-Reymundo first visited San Jose State in middle school, when she joined the Mathematics Engineering Science Achievement program (MESA). She loved math, and when the time came to apply for college, she knew that civil engineering was the best fit. When she joined Luna y Sol, she was excited to learn that there were a number of other engineering majors on the team. She soon learned that she could turn to her folklórico friends for help with homework and adjusting to college life. In March 2017, Luna y Sol performed alongside Union City’s James Logan High School Ballet Folklórico at a Golden State Warriors game in Oakland, Calif. The choreography reimagined a pelea de gallo, or rooster fight. The male dancers’ movements imitated roosters while the women fanned their skirts, bright as butterfly wings. Whether they are performing on campus, at Yahoo! or at Oracle Arena, the troupe emphasizes community. Learn more about Grupo Folklórico Luna y Sol de San Jose State.